As the summer wanes here in the northern hemisphere and the temperatures begin to dip, it will soon be time to think about turning the oven on again. And, in our house, that means it’s time to get ready for lasagna! One of the most versatile ways of making lasagna is in bianco, meaning without tomato sauce. It is a style typical of central and northern Italy. Instead of tomato sauce, you fill your lasagna with béchamel layered with whatever condimento you feel like, whether meat, fish or, my personal favorite, any sort of vegetable in season, sautéed in butter or oil olive, often with garlic or onion to lend savor. We’ve already featured an example of this style of lasagna, lasagne agli asparagi. That post took you through the basic technique, with step by step, illustrated instructions, so I won’t go into details here. The same technique can be used with any other vegetable, with the only difference being how you treat the vegetable condimento. This time, rather than asparagus, I made a spinach lasagna. 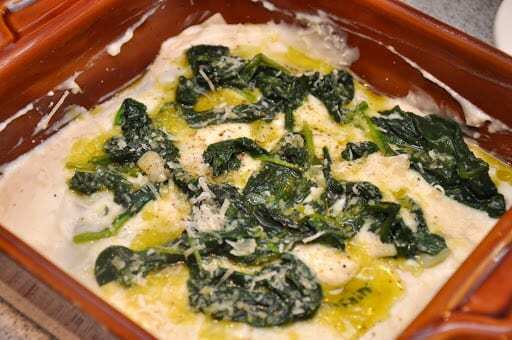 If you are using young spinach, you simply prepare them in padella, adding the rinsed spinach directly into your seasoned olive oil, without draining them too well, and sauté until they have fully wilted, no more than a few minutes. If you are using older spinach, the kind with crinkly leaves, you’ll need to trim the leaves of their stems, then parboil the leaves in abundant salted water for a minute or two before sautéing them. Bake in a hot oven (200°C/400°F) for about 20 minutes, or until just a bit browned on top. As with all lasagna, you should let your spinach lasagna cool off for at least 10-15 minutes before serving it. As mentioned, the same technique shown above for spinach lasagna can be used with just about any filling that strikes your fancy. In the late summer, I particularly like zucchini, for example, which you can sauté just like the spinach in garlic and olive oil. Or, something different, why not try some luscious summer tomatoes, laid uncooked over the béchamel sauce? If you are not feeling too ambitious, you can save considerable time by using store-bought lasagna sheets. Here, though, you need to be a bit careful. A lot of so-called ‘fresh’ store-bought pasta is made with semolina flour, which makes for a tougher dough that is fine for southern-style lasagna but not very apt for a delicate lasagna in bianco. Your better bet is actually using dry ‘no boil’ lasagna, but be aware that no boil pasta absorbs a lot of liquid as it cooks, so use a rather loose béchamel, and lots of it. As the weather cools off, you may want to switch fillings—I think mushrooms are particularly wonderful, or radicchio, pumpkin, butternut squash… but I am getting ahead of myself. Late summer is a special time of year, with its abundance of fresh produce, so enjoy the last of the summer vegetables while we can—and this is a particular delicious way to do so. I cannot wait to try this, this looks sooo good! Thanks again, everyone, for your great comments! Do try this–or any variation you feel like–I'm sure you'll enjoy it. After all, what wouldn't taste good combined with pasta, bechamel and cheese? @Jelena: Yes, mushroom lasagne is fantastic, too. Great for the Fall! @City: Pumpkin and sage: sounds delicious! @Robert: Thanks! You're quite right, lots of asparagus (or whatever vegetable) is key. Otherwise, the taste of the bechamel and cheese will predominate (not that that's so bad, either..) For the asparagus lasagne, I used two bunches to serve 3 people! @elle pee: Actually, zucchine and shrimp is a very common combination in modern Italian cooking. You're right, it sounds a bit odd at first, but it really works well. I love white lasagnas and yours looks especially tempting! I need to try this out… béchamel and spinach is such a great combination that always pairs so well with each other. Ciao Frank… have you tried Lasagna Bianca with zucchini and shrimp with basil? I was grossed out when I first heard about it.. but when it was served to me I thought I had died and gone to heaven! Oh… and your lasagna pasta is clearly home-made and beautiful!!!! now this one without the tomatoes and with the spinach is one I would like very much, – even the spinach version I am used to uses a red sauce … how many ways do you make lasagna? Frank – Wonderful lasagna but with another heat wave on its way, this will have to wait until cooler weather. So glad to see this follow-up on the original asparagus lasagne which has been a summer favorite of ours, thank you very much. Our observation is that it takes LOTS of vegetable and sauce to pull it off – two bunches of asparagus, for example. The sauce is easy, so one should make plenty with some to spare. Looking forward to trying new flavors. Thank you, Frank. You're the best! Yum. I love white lasagne. I love it with pumpking and sage in the fall. You have my mouth watering and looking forward to fall when it is cool enough to turn on my oven. Thanks. wow, lovely! I've never seen that sort of lasagna before. Lookin' good Frank. That does look luscious – when the weather goes back to normal. I am wondering about combiningg the spinach with the fresh ricotta I have… the bianco sauce will need to change a bit.